I just seem to remember seeing some Huerta shapes around Ventura in the '90's. I think they were at Ventura Surf Shop. And he hung at C street. I remember a guy walking into Ventura Surf Shop one day and saying his ol' lady wouldn't let him buy any more Huerta's.. He had snapped the last two. Too thin. Yeah, that's the guy! Worked with Ben Aipa at one time, IIRC. Big guy, I don't think he would make razor thins for personal use, ha! I bought the 9-3A fat boy blank, he said it comes in X too, I said who would want any more foam than this.. he said Me! "Razor thin", LOL. I will have to rib him about that next time I go in. OK, like I said above, I want to "yellow" the foam, to give it that "been around" look. Like this was once a surfboard, then it became a sign (and now its been "reclaimed" as a surfboard). 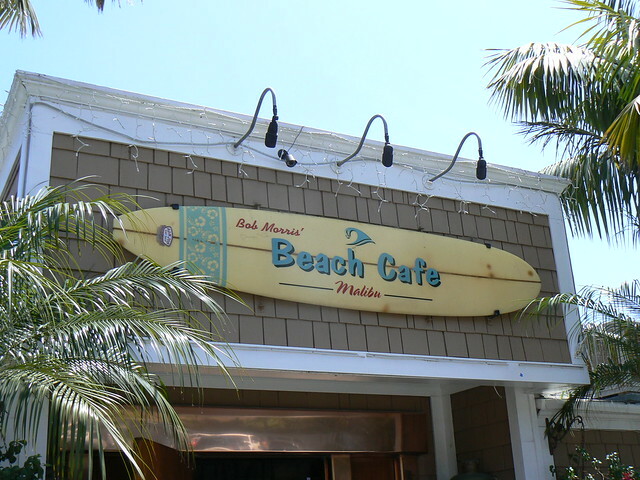 The surfboard sign below is my visual reference for this project. So I went to Lowe's and got a quart of latex, I've used this paint on surfboard blanks before, without any problems. "Lyndhurst Estate Cream" = "Beater Board Yellow", their name sounds more sophisticated, but mine is more to the point! Then I added a few "dings", and 4 "holes" where the sign had been bolted up, as well as a lighter area where the sign posts would have been. It definitely felt weird doing this, taking a pristine shaped blank, and rapidly aging it to an old yellow beater, haha. The sign itself will get painted after the first layer of glass, so it ends up between glass. I just wanted to yellow the foam and some dings and rot going on, before glassing. I never worked so hard on making a ding repair blend in as I worked on making these fakes look real. Too funny! Yeah, that's exactly what I'm trying to accomplish, I mean looks-wise. Airbrush would have been the ideal tool for this application, I just kinda faked it with dry brush technique in combination with watery thinned-out paint technique. My wife is cool, but I still find myself sneaking new blanks into the garage, then when I'm shaping and she asks what board is that I say "just one of those old blanks I had in the garage", hahaha, must be a guilty conscience, cuz like I say she's always been cool about my surfboards. My gal she's been with me since we were 15 and she's like a blood hound and can smell fresh foam within 40 yards, I swear! Love your concept, coolest thing I have seen in ?, aah, a very long time. How about this? Maybe a Marital spat... Ha! I would rather be someone's shot of whiskey, than everyone's cup of tea. Looking good Huck. I mean old. I like what you did there at the stringer. I've made that color with white, a bit of yellow, and some tan. I really want to try that coffee grounds technique. We need to do a colaboration someday. I like working with guys like you. 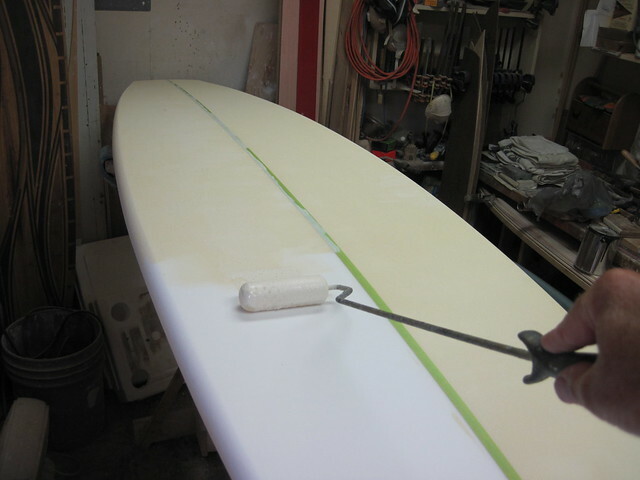 Surfboards made by hand. Not machine. ...We need to do a colaboration someday. Ha! I wouldn't pass up the opportunity. Have an idea, don't know if its even feasible, but will pm you once I take the time to spell out my concept, and see what you think. Huck- the board is looking symmetrical! Are you pp your rails now? It's cool you build what you want... thats pretty much what I do to-although I don't always get what I want!!? Cheers!